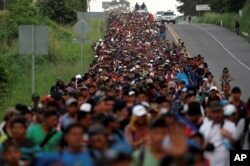 Meanwhile, the Central American migrant caravans were on the minds of President Donald Trump and former President Barack Obama on the last Sunday of campaigning before Tuesday's mid-term election. "Turn back now because you're not coming into the United States unless you go through the process." Trump again said the caravans are full of criminals and "rough people," although reporters who have traveled with the migrants say they have primarily seen women and children. The president said deploying U.S. soldiers to the border shows the United States is "not playing games." In a voice hoarse from several days of campaign speeches, Obama criticized Trump's belief that the migrants are an invasion and a threat. He said the men and women in the military deserve better than to be used for what he called a "political stunt." 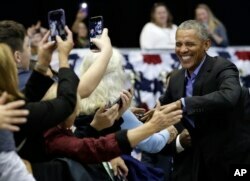 Former President Barack Obama, right, greets Democratic supporters at Genesis Convention Center, Sunday, Nov. 4, 2018, in Gary, Ind. "I've been involved in scores of conversations about stopping illegal immigration from Mexico and never once has there been a discussion of the political impact in U.S. domestic politics," he told CBS's Face the Nation. The main migrant caravan that left San Pedro Sula, Honduras about three weeks ago is still about 1,600 kilometers from the U.S.-Mexican border. The majority say they still hope to be able to get into the U.S. and work, while others have accepted Mexico's offer of asylum and jobs.